With the heavy snowfalls of recent years snow blowers have become extremely popular, and have in many cases removed the trusty old shovel. There is no doubt that this tool saves a lot of back breaking work, although some may consider it to be an unnecessary expense. However if you are in the market for one of these time saving machines, then you need to assess the different types that are available to you. Numerous manufacturers have entered the market, and as a result prices have become far more competitive. You will soon discover there is a large variety to choose from, whether you only want to clear your frontyard, gardens or field there are plenty of options. These are ideal for clearing decking, patios, steps, sidewalks, and driveways. They are very convenient, lightweight and easy to use. In general they can clear snow anything upto 6 inches deep, and as there is no oil or gas they are eco-friendly and require minimal maintenance. They are an obvious choice for the majority of home owners with small to medium sizes gardens and drive ways to deal with. 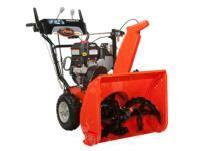 Snowblowers are generally divided into 2 categories, single-stage and dual-stage. The single-stage snow blower is typically smaller, and its name is derived from the fact that both the snow intake and output is carried out by a one impeller. Normally the single-stage blower only covers a relatively small area, having said that it can also be highly effective for larger sized jobs. Dual-stage blowers tend to be more widespread than their single-stage counterparts. The first stage works to break up of snow after intake. Augers deal with this task as well as transferring snow to the impeller, where it blows snow out of the discharge chute. The splitting up into 2 stages in this manner makes it possible to clear large areas of snow covered ground, which will of course depend on the size of the snowblower. These come in many different sizes. To begin with, engine power varies from a few horsepower which typically will be used by homeowners, to thousand horsepower diesel engines for industrial and commercial use. But bear in mind, the engine size is normally decided on with the intention of managing the tasks that the snowblower will encounter. This is perhaps the most common one for use at home. You will find that both single-stage and dual-stage walk behind snowblowers are available, and these can be an inexpensive yet very beneficial option. Fo larger areas of land the riding snowblower is preferred by many people. This is a dedicated piece of equipment, and is comparatively small in size. They are available in a number of shapes and sizes, and as they are for designed to deal with larger snow covered areas this is the natural choice. Finally, there is the snowblower attachment which is for use on tractor and similar vehicles. These are amongst largest snowblowers, and yet are an affordable option, since it is an attachment rather than a dedicated vehicle. So should you have a need to clear a substantial area of snow, own or plan to invest in a tractor or similar vehicle that can support a snowblower attachment, this will likely be the best option. These are amongst the most popular, and are renowned for their ease of use and durability. The choice of models is outstanding and covers all possible eventualities. A snow thrower which has a powerful engine and wide working width, will save you time if the area you have is large and blanketed in deep heavy snow.